Brewing NB's Bavarian Hefeweizen with WY 3068. Needed to install a blow off assembly even though I'm using the big fermentor. 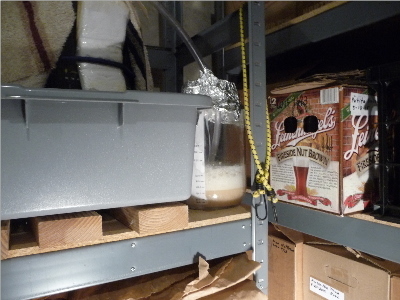 Late the second night after pitching there was pure yeast being pushed through the S-style air lock. I like to harvest so I thought why not harvest this yeast. Installed the sanitized the blow off tube assembly with the pickle jar the yeast starter had been prepared in. No liquid in the pickle jar. Just a little Star San foam. Next morning added a half liter of 1.040 wort to the pickle jar. About 6 hours later had two active fermentations going. One in the fermentor and one in the blow off collection jar.